In the second century hijrah a new theology entered the Muslims through the Jahmiyyah and Mu'tazilah and took the form of establishing a cause for the universe through a rational argument known as huduth al-ajsaam. The language and terminology underlying this theology was founded upon the conceptual baggage of a star-worshipping idolator called Aristotle. By the very nature of the argument, only a certain type of deity could be affirmed, otherwise the proof would be invalidated and that deity had to be characterized through the same Aristotelian language or its necessities. This laid the foundation of the deen of the Jahmites whose foundations were then taken by the Mu'tazilah, the Raafidah, and later, the Ash'ariyyah and Maturdiyyah. They attempted to argue with the Philosophers through this conceptual baggage and as a result were forced, by the very nature of the argument, to assault the revealed texts with distortion. All of these factions were the ones intended by the Salaf's condemnation of Ahl al-Kalaam (people of speculative theology). Whilst they were the despised minority for the first four centuries, a faction amongst them (the Ash'arites) gained strength and prominence in the Muslim lands, gaining sway over regions and leaders during a three hundred year period from 400H to 700H. They added elements to the Ash'arite school that al-Ash'ari himself was free and innocent of, from rejection of Allaah's uluww and the sifaat khabariyyah, entering into the ta'weels of the Jahmiyyah, innovated form of tasawwuf coupled with wahdat ul-wujood, gnostic illuminism and so on. When Shaykh al-Islaam Ibn Taymiyyah came, he stood against these people, exposed their departure from the way of the Salaf, aided the way of the Salaf and reconnected the Ummah back to the way of the Salaf. Both during the life-time of Ibn Taymiyyah (rahimahullaah) and afterwards many lies, fabrications and slanders were spread about him for obvious reasons. Many hateful, resentful, envious Jahmites passed in history, some of them with scholarly standing, who spread doubts (of varying levels of sophistication) against Ibn Taymiyyah. One of the most striking things about all of this is that the enemies of Ibn Taymiyyah in his time actually acknowledged his honesty, integrity and trustworthiness and his accuracy in citation and memorization. What they took issue was his criticism and refutation of their doctrines and traditions (that had no basis in the religion) which they could not stomach. You have to keep this in mind for this article. With that said, we are going to discuss the claim of an individual by the name of Nizar Hammaadi, a Tunisian Ash'ari. With the knowledge that the majority of his audience does not have the means to independently verify his claims, he spreads vicious lies and untruths. The case we are going to take up today involves an attempted defence of Fakhr al-Din al-Razi (d. 606H) from an accurate observation made about him by Shaykh al-Islam Ibn Taymiyyah on the issue of the origination of the universe. Nizar Hammadi attempts to cast doubt upon the integrity of Shaykh al-Islam Ibn Taymiyyah in quotation and attribution of viewpoints. We have spoken extensively on this website about the foundation of ilm al-kalam which is proving the universe to be originated through an argument expressed through the language of Aristotelian Metaphysics. The argument is that attributes (a'raad) and events (hawaadith) in bodies (ajsaam) are evidence of those bodies being originated (haadithah), and upon the corrupt and false principle of "the impossibility of an endless chain of events" the sum whole of all bodies present in the universe can be said to have been originated, leading to an originating cause. The very nature of this argument requires that no "act of creation" could have taken place which is attributable to the cause identified through the argument. Further, this argument requires a particular type of description of the deity (otherwise the proof is invalidated). From here, the symbols of Islamic belief were eroded by the Jahmiyyah and Mu'tazilah in the second century hijrah (in order to make the revealed texts compatible with this argument) and this activity was continued by the later ones, the Ash'aris and Maturidis. These later ones made a pretence of outward affirmation (of attributes) through word-play and definition, but agreed inwardly and in reality with their predecessors, the Jahmiyyah and Mu'tazilah. From those symbols were the uluww of Allaah, His sifaat khabariyyah, His speech (Kalaam), His ru'yah on the Day of Judgement and other affairs. When the Mutafalsifah (Philosophers) such as al-Farabi and Ibn Sina saw them arguing in this way, they saw the flaws in the argument and embarked upon debates which would play out over the next few centuries. Because the proof used by the Mutakallimoon is flawed and corrupt, it could be used to argue the exact opposite, to establish that "no act of creation" took place, that the universe is caused by the mere essence of the first cause, and that the universe is therefore eternal alongside that first cause. The Ash'arites wrangled in this issue and gave incoherent answers, even though they were closer to the truth. By the time the later ones came along such as Fakhr al-Din al-Razi (d. 606H) and Sayf al-Din al-Aamidee (d. 631H) and looked at all the arguments and counter-arguments for each view, they became confused and bewildered. It is here that a phrase was employed (تكافؤ الأدلة), equivalence of evidences, to describe a position that was resigned to by these bewildered people and it means that the arguments for the universe (matter) being originated and eternal were equal in strength. Shaykh al-Islaam Ibn Taymiyyah referred to this on numerous occasions in his works with respect to Fakhr al-Din al-Razi. He indicated that because this proof is corrupt and false, it allowed the enemies of Islaam from the Mutafalsifah to attack Islam through the incorrect views of these Mutakallimeen, leading to wrangling in debate over centuries, leading to confusion and bewilderment. And it has been said that al-Ash'ari affirmed the (position of) (تكافؤ الأدلة) equivalence of evidences and that can be given consideration through al-Razi for he in this (matter) - and it is the matter of huduth al-ajsaam (origination of bodies) - mentions the evidences of both parties and he explicitly states at the end of his book and at the end of his life, and this is the book "Mataalib al-Aaliyah" with (تكافؤ الأدلة) equivalence of evidences and that this issue is from those that bewilder the minds (intellects). Once this is clear we can now move to the crime scene. 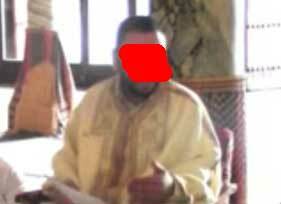 A crime was committed by the resentful and dishonest Jahmite, Nizar Hammadi, who is from Tunisia and is taken as a shaykh who is studied under. This was posted on one of the Arabic forums and was subsequently translated into English and spread. 01. We have frequently mentioned in our articles a general rule of thumb, a theorem, that one must hold onto, which is "never, ever trust a Jahmite in citation." This theorem has been arrived at through the scientific method and the following observational data: Zubair (see here), Abu Adam Naruiji (see here), the Philadelphian Jahmites (see here), the Ma'rifah blind-followers (see here), the pretender Abu Layth (see here), the deceiver Abdullah Ali al-Amin (see here), GF Haddaad and his babies, Faqir et. al. (see here, and also here), Nuh Keller (see here and also here), also Hamza Yusuf (see here). When it is the case that all of these individuals have to defend a theology whose origins lie with the Hellenized Jews, Christians and Sabeans and ultimately in the conceptual baggage of Aristotle (whose language and terminology formed the basis of kalam theology) against the theology of the Qur'an, the Sunnah and the Salaf of the first three generations, then one has to be very careful in verifying what is claimed by these Jahmites when they quote and cite, because such a false creed can only be propped up by lies and distortions. And what we are going to present below is an excellent illustration of this. 02. That which is established from Ibn Taymiyyah in all his works is that the greatest of people in doubt and confusion are the Ahl al-Kalam and this is especially so with people like al-Razi in whose works one can see utter, mass confusion. Ibn Taymiyyah often points this out in his works indicating a) the contradictions in al-Razi's polemics such as arguing for a matter in one book and then refuting it in another (and vice versa) or b) that he will bring powerful rebuttals against a position (held by him) then bring very weak arguments to defend it or c) at times he will mention conflicting evidences essentially validating both without clarifying the matter and stating it is just way too difficult to really resolve. 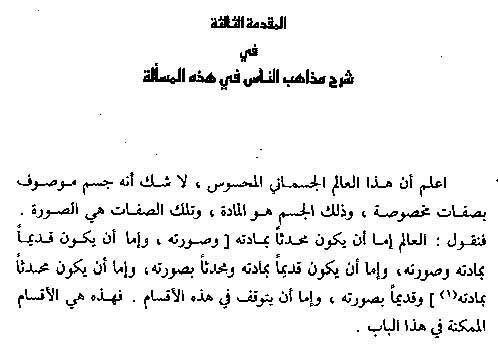 This latter one is what we find in Mataalib al-Aaliyah, in the fourth volume, in which he is discussing the origination or eternality of bodies (the universe). 03. To the right you can see the cover for the fourth volume of Mataalib al-Aaaliyah, one of the very last books by Fakhr al-Din al-Razi. The approach we are going to take today is represented by the zoom out method. This means we will look at the quote used by the Jahmite (Nizar Hammadi) to malign Ibn Taymiyyah, then zoom out a little so we can see what is on the page, then zoom out a little more so we can see what is in the entire chapter. Then zoom out a lot more so that we can see what is in the rest of the book. By zooming out in a step-wise fashion, we will start seeing the bigger picture and the fraud of Nizar Hammadi will be complete and all that will remain thereafter inshaa'Allaah, is just another empty-handed, empty-pocketed resentful Jahmite hater who is better off kicking stones in back-alleys than spreading lies against pious Scholars of Ahl al-Sunnah. 05. Before we bring the the actual quote in Mataalib al-Aaliyah, let us make sure we understand the issue here. 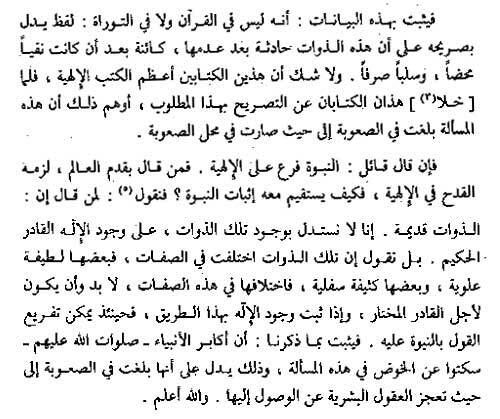 Ibn Taymiyyah mentions the uncertainty of al-Razi in that he brings evidences of both parties, those who say the universe is originated and those who say it is eternal, and that he affirms the position of equivalence with respect to them in the book in question. In response, Nizar Hammadi alleges that this is a lie upon al-Razi and that al-Razi was merely quoting a statement of Galen, to whom this view is attributed. This therefore is a proof that Ibn Taymiyyah was dishonest and lied upon al-Razi. That's the essence of the matter. In addition to this, it should also be pointed out that none of the adversaries of Ibn Taymiyyah actually questioned his honesty and integrity in quoting and citation. In fact many of them acknowledged the vastness and superiority of his intellectual capacity over them, and this is found mentioned in the biographical accounts provided by al-Dhahabi amongst others. As for the fifth category: It is withholding (hesitancy), without (claiming) certainty. This is quoted from Galen,, for it is related from him that he said to some of his students during the illness in which he died, "Write from me: I do not know whether the universe is originated or eternal and that I do not know whether the soul is a state of mind or not a state of mind." And there are some people who have made this a revilement upon him and said, "He left the world just as he entered it, not knowing these things." We have a number of things here: Pay attention to the following things which become apparent from this paragraph. Al-Razi mentions "the fifth category" which means there must be four others. Further, he does indeed quote Galen. And this is the only thing mentioned by Nizar Hammadi. But we see what appears to be a defence of Galen by al-Razi when he says, "And there are some people who have made this a revilement upon him." So straight away we see that there is more to the story that this Jahmite hater has not revealed (on purpose of course). So lets zoom out a little more. And we say: This is from the most evident of evidences to show that the man was just, a seeker of truth. For speech in this matter has reached such difficulty and cumbersomeness that most of the intellects fade away therein. And Allaah knows best. Now it becomes clear that al-Razi is actually defending Galen and is claiming that Galen's position is "just" and shows "seeking of truth", this being justified because the issue is one of "great difficulty", difficult for most of the intellects. Now, lets zoom out a little more and go to the opening of this chapter on page 19 and see what we can pick out from there. Know there is no doubt that this perceived material world is a body (jism) described with specific attributes and that this body is matter (maaddah) and those attributes are form (soorah). So we say: The universe is either originated in both is matter and form, or it is eternal in both its matter and form, or it is eternal in its matter, originated in its form, or it its originated in its matter and eternal in its form. Or (a person) withholds from these (four) categories (of possibility). So these are the available possibilities in this matter. So now the larger picture is starting to emerge. It is clear that after discussing each of these four scenarios, al-Razi finished by discussing the fifth position of withholding and being uncertain, and he cited Galen in this and then essentially praised this position, justifying it and defending Galen against criticism. What this begins to reveal is the actual conclusion being presented in the book as a whole which is that due to the extreme difficulty in this matter, the most praiseworthy stance is to withhold and not be certain either way. That al-Razi mentions the evidences for both sides does not mean he is arguing for either, rather, he is simply compiling all the evidences out of comprehensiveness, and even if he may incline to one view, he acknowledges the actual evidences are so strong and equivalent in strength that they do not allow certainty to be had. This is a clear indication of doubt and uncertainty. Now lets zoom out a little more. So it is established from this that there is nothing in the Qur'an what indicates the origination of the entities. So it is established from these explanations that there is not a word in the Qur'an or the Tawrah which indicates explicitly that these entities are originated after being non-existent, coming to be after they were pure negation and pure nothingness. And there is no doubt that these two Books are the greatest of the Divine Books, so when these two books are devoid of explicitly (making reference to) this desired objective, then it has given the presumption that this matter has reached difficulty until it actually turned into one of difficulty. If a person says: Prophethood is a branch of Divinity, hence whoever spoke of the eternity of the universe, revilement of Divinity is binding upon him, so how can affirmation of prophethood be in harmony with that? Then we say to the one who says that the essences are eternal: We are not inferring from the (mere) presence of those essences for the presence of the powerful, wise deity. Rather, we say that those essences vary in their attributes. Some of them are sparse and high and some of them are dense and low, their variation in these attributes must be due to a (an entity with) power and choice (qaadir, mukhtaar). When the existence of a deity is established through this route then it is possible to branch off the saying of Prophethood through it. And from what we have mentioned (here) it can be established that: The greatest of the Prophets (salawaatallaahi alayhim) remained silent away from disputing about this matter. And this indicates that it has reached such a level of difficulty that human intellects are rendered incapable of reaching (at the truth) therein. Allaah knows best. Allaahu Akbar! He first invalidates all those words that can be used to show that the matter of the universe had a beginning [rabb (lord), khalq (creating), faatir (originator), ghaniyy (free of need), awwal (the first), kun (be)], then he raises the issue of the implication this has on arguing for Prophethood (which is dependent upon the universe having a beginning) and in response he simply brings the argument originated by the Mutafalsifah such as Ibn Sina of al-Takhsis (specification), in that the variation of attributes in entities proves a creator. 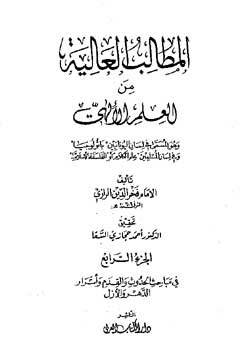 Those Mutafalsifah did not like the method of huduth al-ajsaam and devised their own methods of proving a creator such as those of al-tarkib and al-takhsis (alongside which one can maintain an eternal universe) and al-Razi actually uses and implements both of these arguments in his works, something for which he was criticized and reviled by other As'harites such as Muhammad al-Sanusi (see this article for example). And here we see him arguing that even if the bodies are proven to be eternal that in no way affects our ability to argue for a creator, because we can use the argument of al-takhsis (specification). Also note what he says at the end of the above quote, "And from what we have mentioned (here) it can be established that: The greatest of the Prophets (salawaatallaahi alayhim) remained silent away from disputing about this matter. And this indicates that it has reached such a level of difficulty that human intellects are rendered incapable of reaching (at the truth) therein. Allaah knows best" which is explicit in stating that Prophets never spoke about this matter at all (let alone clarified it) and that it is something the truth of which the human intellects can never arrive at! See quotes below from Ibn Hajar and Muhammad al-Sanusi. The matter by now is very clear, but we can zoom out a little more and finish off with a couple more revealing quotes from the book. And this is a definitive evidence proving that the caused (ma'lool) being in need of a cause (illah) is not dependent upon the caused being originated. He intends by this to validate the arguments of the Philosophers that a simultaneous cause and effect relationship (without the effect being delayed from the cause at all, rather being simultaneous) does not require or depend upon the effect itself being originated. Rather a cause and effect relationship can exist without this condition. And al-Razi describes the proof demonstrated by the Philosophers as a burhaan qaati' (definitive, decisive evidence). 11. As for the arguments of those who argue for the origination of the universe, al-Razi discusses them from page 241 onwards and a large part of it is take up to discuss the proof for the universe arising due to an entity that has power and choice (qaadir, mukhtaar) rather than it's presence being necessitated by the essence of an eternal entity (mujab bil-dhaat). After this he covers some miscellaneous issues pertaining to the view of the Philosophers and other factions. Now of course al-Razi, in this book as well as others, mentions the evidences for the origination of the universe. However, the point is that when you look at the volume as a whole and you see what he has really done and where he has left the reader and what he himself says clearly in various parts, it all indicates his doubt and uncertainty and the reality of the affair becomes clear. What this shows is the great dishonesty of Nizar Hammadi, it is deliberate and intended. If all you were able to do is to cite just the statement of Galen, and you neglected to mention everything else (whether it is on the same page, or in the same chapter or what is in the rest of the book), then you have established yourself a dishonest liar and a cheap one at that! Know that when these doctrinal schools are summarized from this angle, and the praiseworthy and blameworthy elements of each one of them becomes apparent, then it is here that the people of bewilderment and perplexity say: "These evidences have not reached clarity and strength to a degree that removes doubt and cuts off the excuse and fills the intellect with their light and strength. Rather, every one of them has an element of obscurity." And it is befitting for the all-Merciful (al-Raheem) and the Generous (al-Kareem) that he pardons the one who errs in the likes of these difficult areas. 13. It is very clear from what has preceded that al-Razi presents, with strength, the arguments of those who say the universe is eternal, he presents all the arguments of the Philosophers who counterargue against the arguments of those who say it is originated and gives them support through his own words. Just as he also presents the arguments of those who say the universe is originated but undermines them in certain ways, and he invalidates the Qur'anic evidences indicating the universe is originated by explaining away terms such as rabb, khalq, faatir and so on. Ibn Taymiyyah's characterization of al-Razi is extremely accurate, and this is not the only incident in which the superiority of Ibn Taymiyyah in accuracy and his shining honesty is apparent. There are many others, the example from al-Baqillani regarding al-uluww and al-istiwaa (read here), and also a citation from al-Ash'ari from his Maqaalaat in which Ibn Taymiyyah points out the error of Ibn al-Fawrak in wrongful quotation (we have alluded to this in some articles), and also his accuracy in citation from al-Ibaanah of al-Ash'ari as it pertains to the attribute of eyes (see here). The examples are in fact abundant and a separate article would be needed to give brief coverage to this issue. However, as we said before, none of the adversaries of Ibn Taymiyyah were so bold as to question his integrity. In fact many of them acknowledged his towering superiority over them in numerous fields of knowledge and acquaintance. These types of attacks upon Ibn Taymiyyah only came when uncouth, foul-mouthed, fanatical pseudo-scholars appeared on the scene in the 20th century such as Muhammad Zahid al-Kawtharee and whoever followed in his path of academic fraud. (له تشكيكات على مسائل من دعائم الدين تورث الحيرة، وكان يورد شبه الخصم بدقة ثم يورد مذهب أهل السنة على غاية من الوهاء), He has doubts (presented) over the issues from the foundations of the religion which bring about bewilderment, and he would present the doubts of the opponents in great detail, and then present the madhhab (doctrine) of Ahl al-Sunnah with extreme flimsiness (weakness). That's what al-Razi does in many of his works! And that is exactly what he has done in Mataalib al-Aaliyah, and resigning to the position that this is an extremely difficult matter in which a person could be excused because it bewilders the mind. Does the issue of whether the universe (in matter and form) is originated confuse and bewilder minds? When Allaah is the Rabb, the Khaaliq and the Faatir, these names make it apparent and clear that everything besides Allaah is originated and came to be after its own non-existence. Through this alone it is known that all arguments to the contrary are futile. And that's all that the average Muslim needs to know. But when you get into this Kalaam and Falsafah and abandon the Book and the Sunnah, this is the evil end that these people are led to. They wasted their entire lives in conceptual nonsense only to learn, at the very end of their lives, that barren old village women are firmer and sounder in religion (due to remaining upon the fitrah) than these (people of kalaam) ever were through their pseudo-intellectual babble. And it could be plausible that the reason for his (al-Razi's) supplication with this is what he knew of his condition of craving to memorize the opinions of the Philosophers and the People of Desires and propagation of their doubts and his strengthening their citation alongside his weakness in determining the reply to many of them - based upon what is apparent from his authorship. And they pilfered him (i.e. won him over) in some beliefs, and he departed (getting) close to their abominable desires. For this reason, the Shaykhs warn from looking into much of his authorship. The Shaykh Abu Abdullah Muhammad bin Ahmad al-Muqri at-Tilmisani (may Allaah have mercy upon him and be pleased with him) said, "Whoever ascertained the speech of Ibn al-Khateeb (i.e. ar-Razi) will find him stronger in corroborating the doubts than in separating from them (i.e. in repelling them), and in this there is what is not hidden (of the warning against his books). My Shaykh, Abu Abdullah al-Iblee recited poetry to me, saying: Abdullah bin Muhammad bin Ibraheem az-Zamuri recited poetry to me, saying: Taqi ud-Din Ibn Taymiyyah recited some poetry of his to me, saying (in poetic form): "Muhassal Fee Usool ud-Din", and his "Haasil." And his "Tahseel", it is knowledge without religion. The foundation of misguidance is in manifest falsehood. For whatever is in it, then most of is the inspiration of the devils. He (as-Zamuri) said: And in his hand he (Ibn Taymiyyah) had a staff and he said, "If I reached Fakhr ud-Din I would have beaten him on his head with my staff" End (of quote). Allaahu Akbar! That's a prominent Ash'ari scholar (al-Sanusi) saying this! Where are you Nizar Hammadi and where is your cheap fraud? Should we not discipline you with the staff of Ibn Taymiyyah for defending al-Razi in falsehood?! There is nothing in the Qur'an whose apparentness indicates that an existence other than Allaah's existence, or a (measurement) of time independent of Him (Allaah) is co-present (equal) with His existence. And what you have mentioned indicates (only) that the Throne was before the heavens and this is true. However, this does not (show) that the Throne is eternal, and (mention of) its creation has come in the ahaadeeth such as the hadeeth of Abu Zareen that it is to follow shortly, alongside what is in the Qur'an that He is the Lord of the Earth and the likes of that. And likewise what is therein of the mention of a (measurement) of time prior to this time, which is connected to the motion of celestial bodies, that does not indicate that it is eternal, co-present along with the existence of Allaah the Most High. And likewise what it contains of the mention of the matter for the creation of the heavens of Earth, it does not necessitate that that matter is eternal. This is alongside what is in the Qur'an that He is the "Creator of every single thing" (39:62) as occurs in more than one place and the "Lord of every thing" (6:164). And the word khalq (creation) negates what they mention of the universe being binding (in its existence) alongside Him, just as an attribute (sifah) is (binding) for the one described (mawsoof). This is only one quote of scores in which it is made clear that Allaah being the Lord (Rabb) and Creator (Khaaliq) indicates that everything besides Him is created by Him preceded by its own non-existence including measurements of time, the Throne, the matter (from which the heavens and earth are created) and the universe itself. Another ignorant, hate-filled, resentful Jahmite exposes himself in broad daylight trying to cover up for a creed that came to factions of misguided Muslims in the second century hijrah through the Hellenized Jews, Christians and Sabeans and whose conceptual terminology ultimately derives from the philosophy of a star-worshipping idolater of the fourth century BC. Nizar Hammadi has not done his cause any good and it is the same with all the other Jahmites we have addressed on this website. How can they, when their cause is futile in the first place? They are intellectually defunct, don't even know what is in the books of their own scholars, cannot even quote properly (and with integrity), they rarely understand the issues and don't even appreciate history. The majority of them are so deluded they can't even see the true and real origins of their theology. They think that by (attempting) to malign and attack mountains such as Ibn Taymiyyah that the common-folk will more easily buy into their outdated, defunct theology (based on al-ajsaam wal-a'raad), a theology which if presented to them directly and frankly, would turn most of them into atheists due to their fitrah (natural disposition) rejecting such a theology, a matter agreed upon by both the Mutafalsifah and the Mutakallimeen [Ibn Sina (see here), al-Ghazali (see here), al-Razi (see here)].